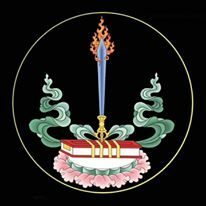 The practice of the four causes for rebirth in Sukhāvatī, for those who wish to be reborn in Sukhāvatī [the Pure Land of Amitābha Buddha], is as follows. O guide Amitābha, please consider me. And there bring my training in perfect aspirations to culmination. I pray to the Buddha Amitābha. Please bless me to accomplish this. By the one named DHĪH.